Moses lived in a place called Midian. He worked as a shepherd, caring for his father-in-law’s sheep. One day as Moses was watching the sheep, he noticed something very strange—a bush that was on fire but not burning up! Moses was curious about the bush, so he went over to look. As Moses got closer to the bush, he heard his name being called, “Moses, Moses.” “Here I am,” he answered. The voice said, “Do not come any closer. Take off your sandals, because the place you are standing on is holy.” The voice said, “I am the God of your father, the God of Abraham, Isaac, and Jacob. Moses listened but was afraid to look at the bush. God said, “Moses, I have seen how badly Pharaoh is treating My people. They are suffering greatly. I have heard their prayers. I have come to rescue My people from the Egyptians.” God told Moses He wanted to bring His people out of Egypt and into a good land where they could be happy. Moses still did not think he could do what God was asking. Moses had another question for God—“What if they don’t believe me?” God told Moses to throw down his shepherd’s staff. So Moses threw down his staff, and suddenly it turned into a snake! Then God said, “Pick up the snake by the tail.” So Moses grabbed the snake by the tail, and suddenly it turned back into a staff. Moses knew that God was a powerful God! Moses continued to talk with God, and he finally agreed to go to Pharaoh. Moses took his wife and family and began their long journey to Egypt. Moses also took God’s staff in his hand. He knew that God would be with him. God is a God who reveals Himself in a way that can be understood. He typically speaks to us now through the Bible. 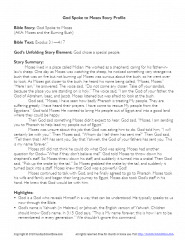 God’s name is Yahweh (in Hebrew) or Jehovah, the English version of Yahweh. Children should know God’s name. In 3:15 God says, “This is My name forever; this is how I am to be remembered in every generation.” We shouldn’t ignore this command. God sees us in every circumstance and knows everything we’re experiencing. However things may appear to us, God sees us and speaks to us in the midst of our situations. God has a plan that goes beyond our individual lives and our particular generation. It’s not all about me! There’s no reason to doubt that this story actually happened as we have it recorded. But, Moses likely also intended for the story to become symbolic of God speaking to His people from the “fire” of their slavery and affliction. It was not terribly uncommon for bushes in the desert to become dry and spontaneously burst into flames. When that happened they would burn quickly and be gone. What’s different here is that this bush was burning, but not consumed. The Exodus probably occurred around 1446 B.C*. This event happened shortly before the Exodus, although it would have taken some time for Moses to “pack up” his family (Ex. 4:20), reunite with Aaron (Ex. 4:27-28), and make the journey to Egypt. We’re not told how long all of this took, but it would not be unreasonable to assume several months. *See Walter C. Kaiser, Jr., EBC, p. 291. Compare with Bright, p. 123. We’ve chosen to go with an earlier date for the Exodus.